Veggie Enchiladas make an excellent weeknight dinner. They are filled with poblano peppers, bell peppers, cilantro, tomatoes, corn, and refried black beans. Then they are topped with cheese and verde enchilada sauce. The best part, you’re going to love, is the chile lime crema that is drizzled on at the end. These might be my new favorite enchiladas!? 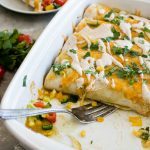 If you love enchiladas as much as me, then you do not want to miss this simple veggie enchilada recipe. 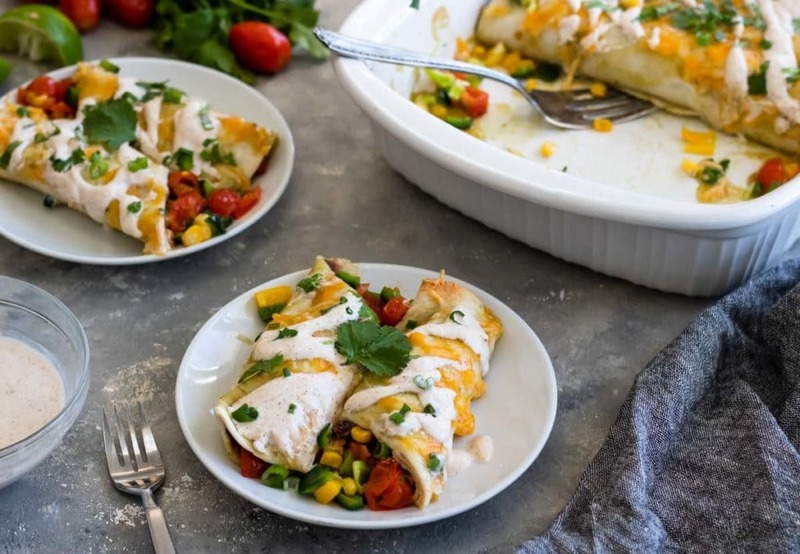 If your love runs deep then definitely check out these other amazing enchilada recipes: my chicken enchiladas, and creamy verde enchiladas. All amazing! 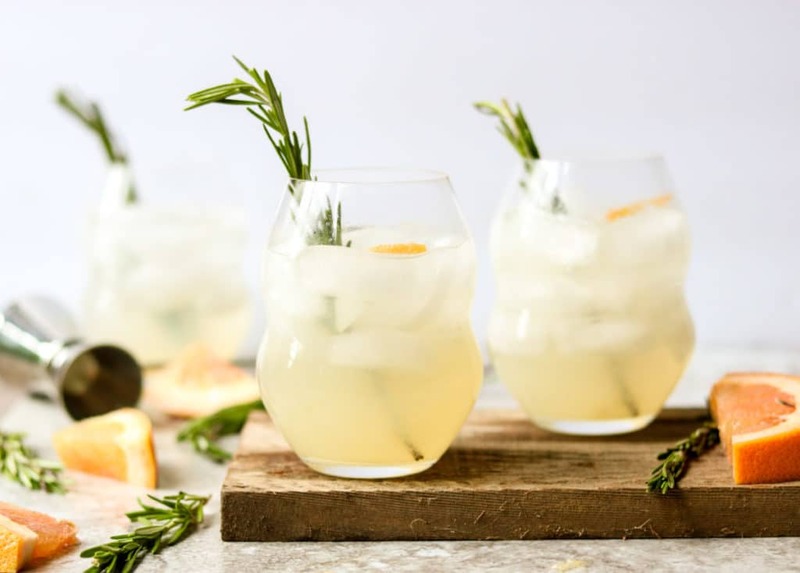 You can complete this dinner with chips & homemade salsa, a Rosemary Paloma or Cranberry Ginger Margarita and that’s all you need! If you are trying to inject more vegetables in your diet, like me, then this vegetarian enchilada recipe is going to be your new go-to. 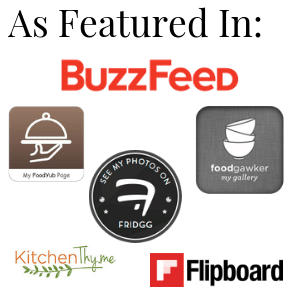 They are not only delicious and full of veggies, they only cook for 12 minutes (WHAT!? ), making this a simple dinner recipe. Which all Mom’s need, right!? Start by preheating your oven to 450 degrees. You are going to cook these enchiladas hot and fast. Then over medium heat on the stove top, warm a tablespoon of oil in a large skillet. Saute the poblanos, bell peppers, and garlic for about 5 minutes until they begin to slightly soften. 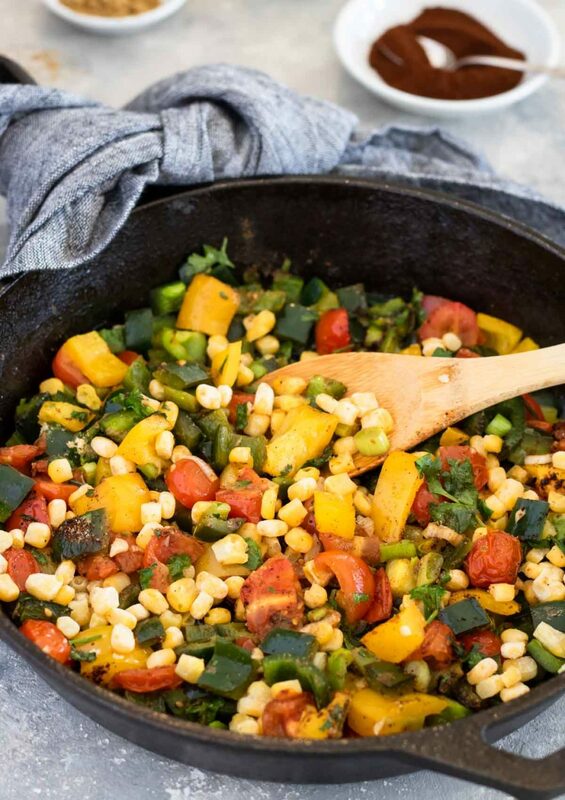 Add the spices, corn, green onions, cilantro, and tomatoes and cook for another 4-5 minutes. Set that aside to cool a little, while you prep all the other ingredients. Spray a large (9×13) glass baking dish with non-stick spray. Spread a heaping tablespoon of black beans down the center of the flour tortilla and then top with some of the veggie filling. Now roll the tortilla over the filling and lay it in your prepared baking dish, seam side down. Once you have all the enchiladas rolled, top them with the entire can of verde enchilada sauce, and then sprinkle the cheese evenly over the top. Pop that in the oven, uncovered, for 12 minutes. 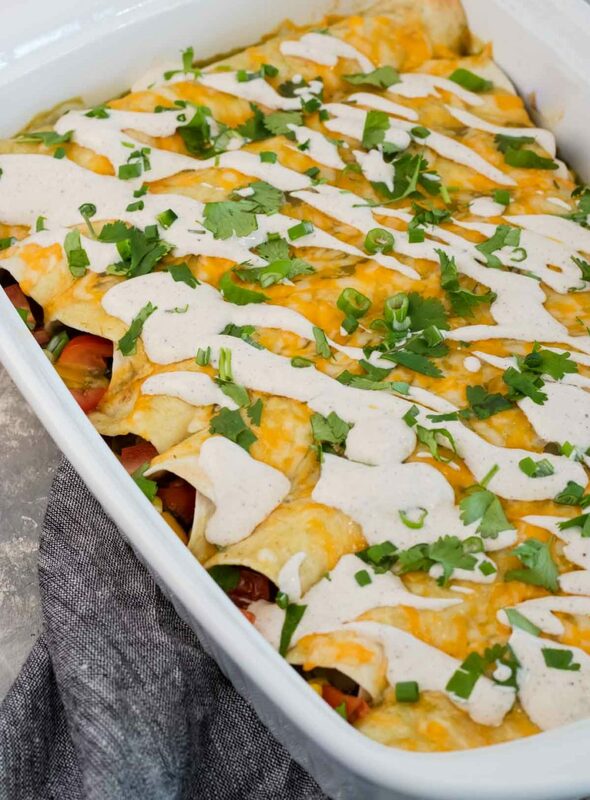 While your vegetable enchiladas bake make the AWESOME chili lime crema! In a small bowl combine the Greek yogurt, chili powder, salt, garlic powder, water, and lime juice. Whisk or stir it together until it is completely combined and smooth. It should be thin enough to drizzle/pour. If you need to add a little more water, go ahead, but add a teaspoon at a time, you don’t want it too watery! After the enchiladas come out of the oven, let them cool for about 5 minutes. Then drizzle 1/2 the Chili Lime Crema over the top, and garnish with extra green onions and cilantro. Serve the remaining Crema on the side. 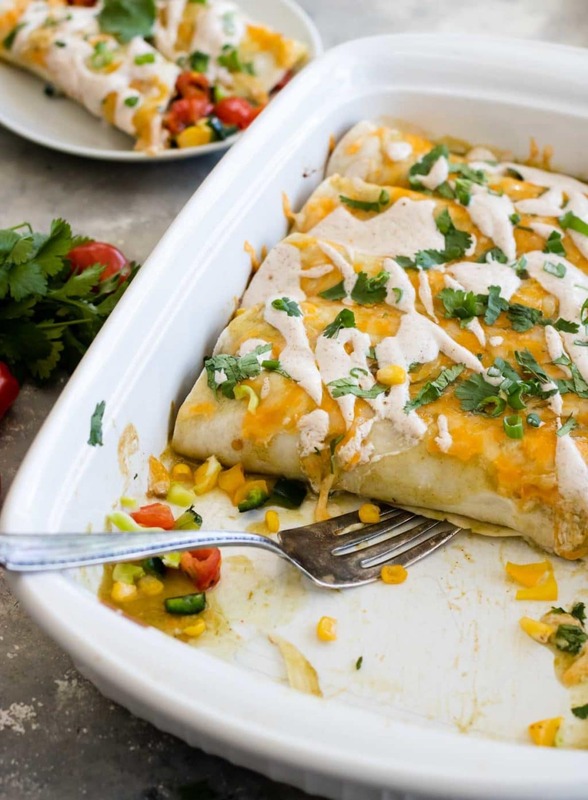 I hope you give these amazing Veggie Enchiladas with Chili Lime Crema a try in your kitchen. And if you do, let me know!! Veggie Enchiladas are a simple dinner recipe that are perfect for a weeknight. They are full of vegetables and topped with verde enchilada sauce and cheese. After they bake (only 12 minutes!) 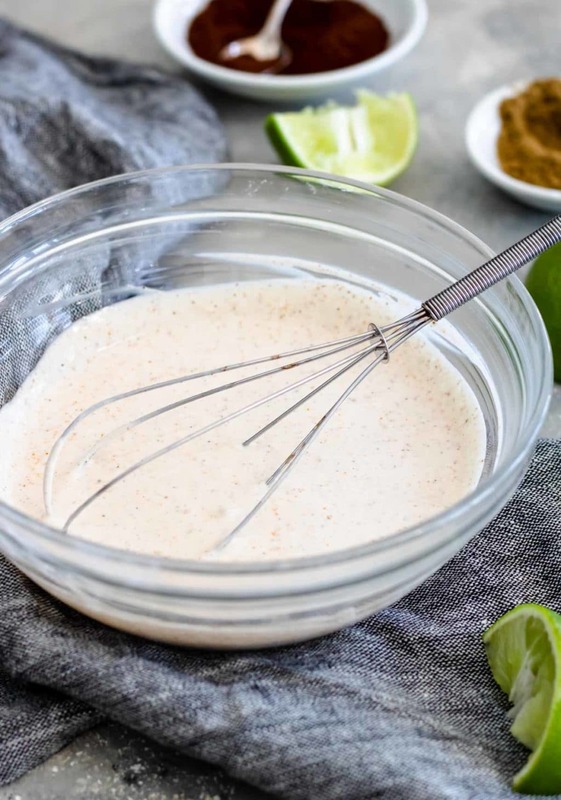 they get drizzled with an AMAZING Chili Lime Crema. 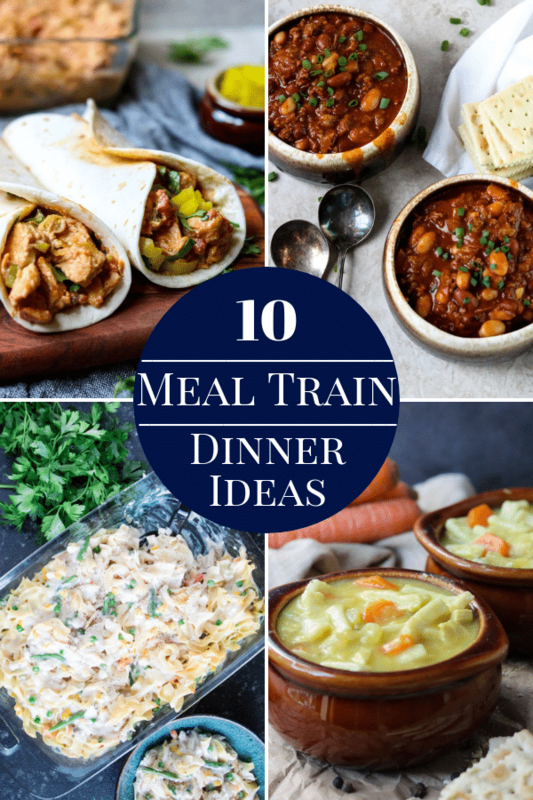 This will be your new go-to healthy weeknight dinner! Prep a 9x13 glass baking dish with non-stick baking spray. On the stove top, in a skillet over medium heat, saute the poblano peppers, bell peppers, and garlic in the oil for 5 minutes. Then add all the seasonings & spices, green onions, tomatoes, corn, and cilantro and saute for another 5 minutes. 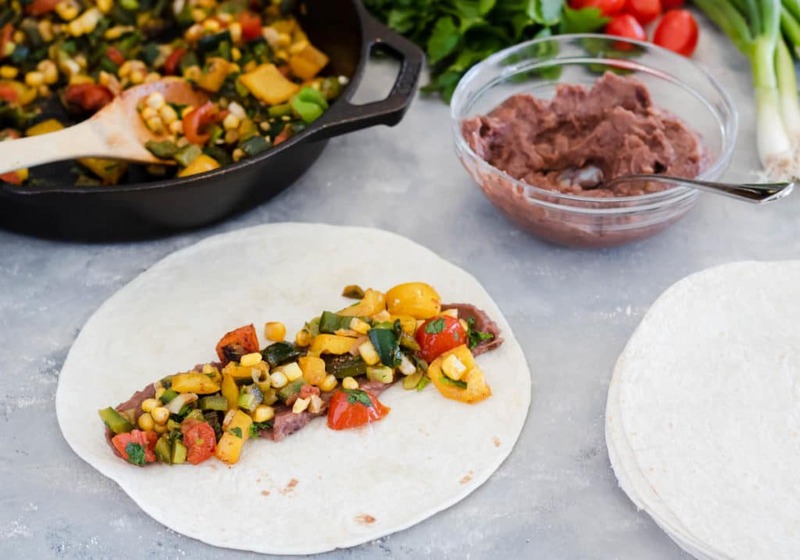 Spread 1 heaping tablespoon of refried black beans down the center of a flour tortilla and then top with some of the sauteed veggie mix (dividing the veggie mix evenly between all the tortillas), roll the tortilla over the filling. Lay each tortilla, seam side down, in your prepared baking dish. Pour the verde enchilada sauce over the rolled enchiladas, then sprinkle the cheese evenly over the top. Bake, uncovered, for 12 minutes. Set aside and let cool for 5 minutes. Combine all the crema ingredients in a dish and whisk or stir until it is completely combined and smooth. 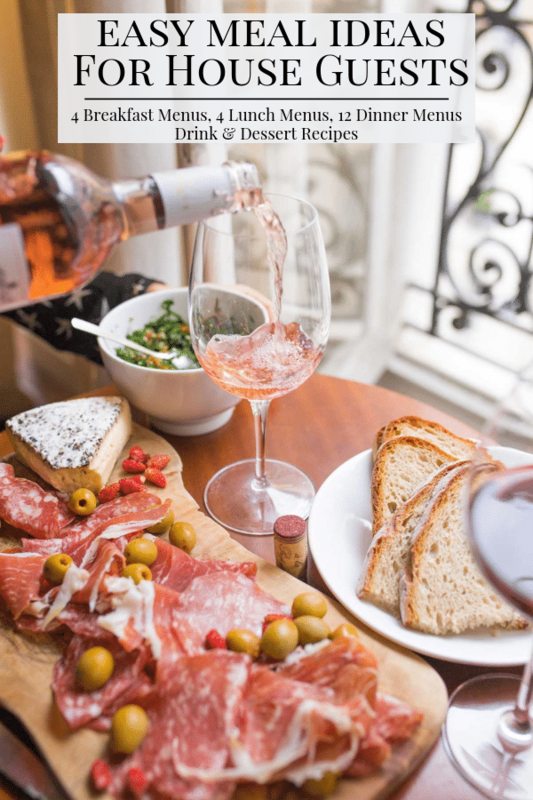 It should be a consistency that you can drizzle or pour. If you need to add more water, do so, a teaspoon at a time. You do not want it to be too watery! Drizzle or pour half of the Chili Lime Crema over the enchiladas and garnish with extra chopped green onions and cilantro. Serve the other half of the chili lime crema on the side. Oh these are amazing, thanks for sharing the recipe! I am a big fan of enchiladas, even if they are only veggies! 😉 The peppers combined with the crema flavor…yum! Me too! It’s the one meal I could eat again and again. 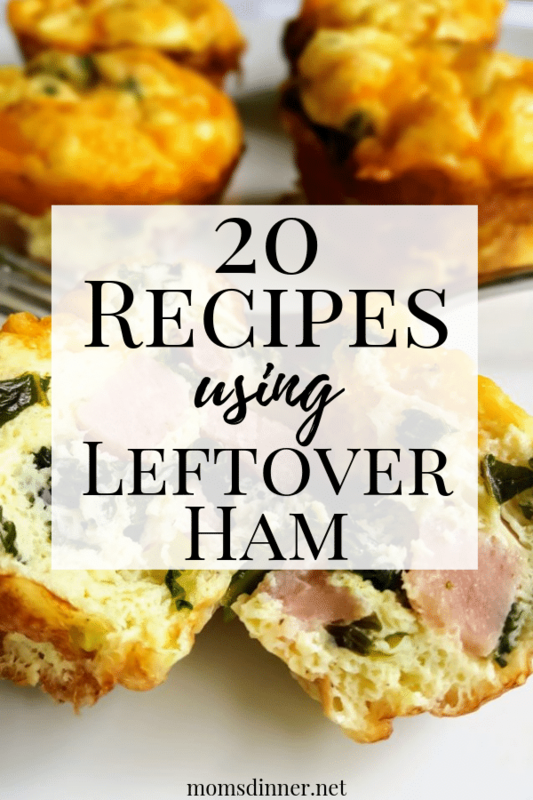 My husband is a meat-a-tarian for sure and he even loves these…A LOT! This is one of my favorite recipes at Mom’s dinner.net. ⭐⭐⭐⭐⭐ all the way! Thank you !! Might be one of mine too!